It's Kaiju Candy time again and this time they are brighter, kookier and pack even more of a punch! Full of creepy crawlies and monsters, bees and bold shapes this selection is my favourite so far. 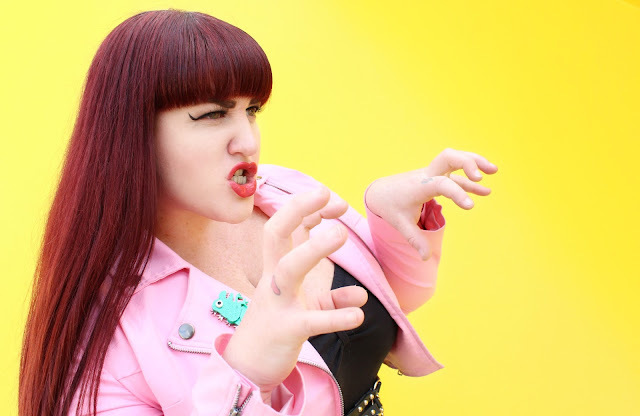 What I love most about Donna's range is the focus on all things both spooky and sweet and the amazing colour pallet used to create all of her accessories. 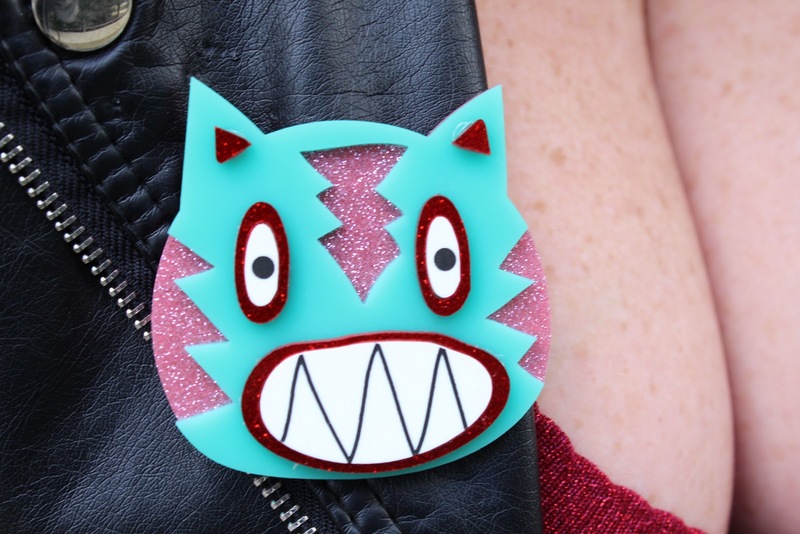 With bold outlines, shapes and a little sparkle the Kaiju Candy range really pops. Oh how I love wearing bugs!! I have scarabs, bees and lots of creepy little things in my collection but this giant yellow fella is the biggest and the brightest. Brother to the Kaiju Candy 'The Fly' brooch this pin is perfectly designed so we can see the iconic yellow and black stripe beneath the wings - Donna, this is pure genius! I missed my chance to snap up the fly but hopefully I can get him soon and wear these together. I'm slowly falling in love with the colour blue it seems as it pairs perfectly and really pops with my hair colour. So when I saw the blue and Gold Magic Moon Earrings I knew I had to own them. A simple yet stunning design that sparkles like crazy in the sunlight and matches just about everything in my wardrobe. Giving off witching hour disco vibes and that alone is enough inspiration to plan an outfit. It's safe to say then whenever I find any music related accessories I snap them up and these amazing blue quavers are the perfect addition to my collection. A bold shape covered in stunning multi coloured blue glitter. If there is one thing we always fall hard for from the Kaiju Candy ranges it has to be their amazing Monsters. Donna has an amazing ability to take a scary iconic monster and make he or she the cutest little critter! Thank the iconic Godzilla reptilian creature and make it the cutest, most sparkly and sweet brooch on earth with a little bit for colour play and adorable design. Available in Green or Pink and currently sold out but hopefully to return asap. What I love most about this little fella is the contrasting use of colour. 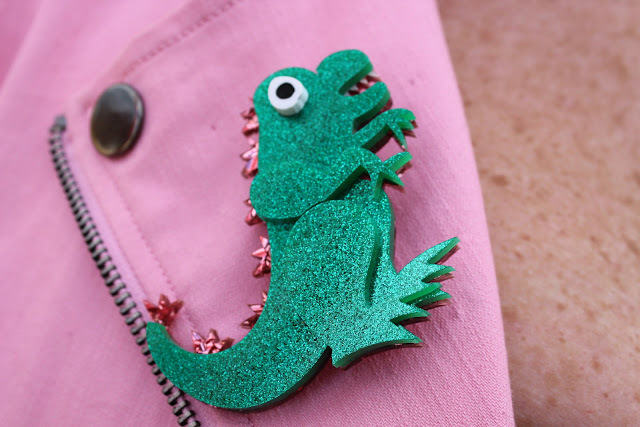 The bold green paired with the pink glitter spikes on this back and tail really make this style pop. 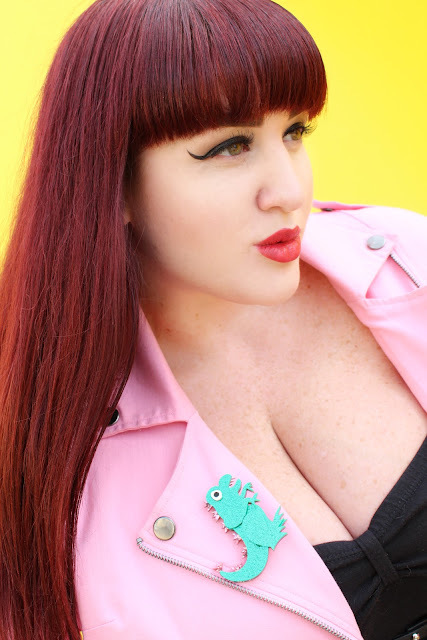 I'm also now a huge fan of pairing bright green and pale pink together after styling this look and I think I need to find more accessories and tops to match! My love for Donna's handy work started many moons ago when her label Hansel and Gretel was very popular. One of my most loved and treasured pieces was her Sand worm and I still have it. So when Kaiju Candy released all of these amazing Beetlejuice inspired items I had to snap up each and every one. 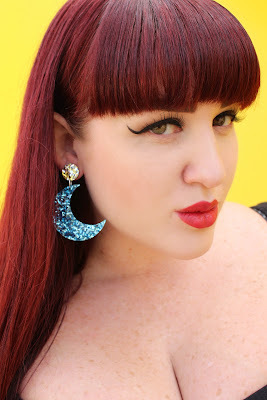 The sleek and streamline worm earrings are absolutely perfect and the brooch is FIERCE! I just adore the little sandworm head popping out of the bigger worms mouth it's two worms for the price of one! I'm also loving the use or teal/and red for highlight. More quaver earrings this time in my favourite colour way of silver and ruby red! These pop so brightly and pair perfectly with my little baby sandworm. 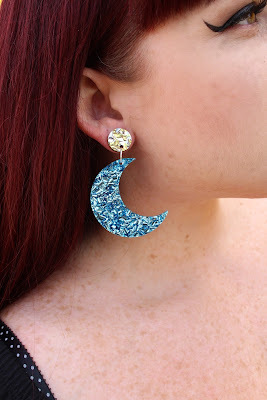 What I love most about these earrings is how well they work as solo statement piece and I can't wait to style my hair in an up-do to make these the main focus. The smaller sandworm follows the same shape and style of the earrings and I love the size and shape of this little guy. 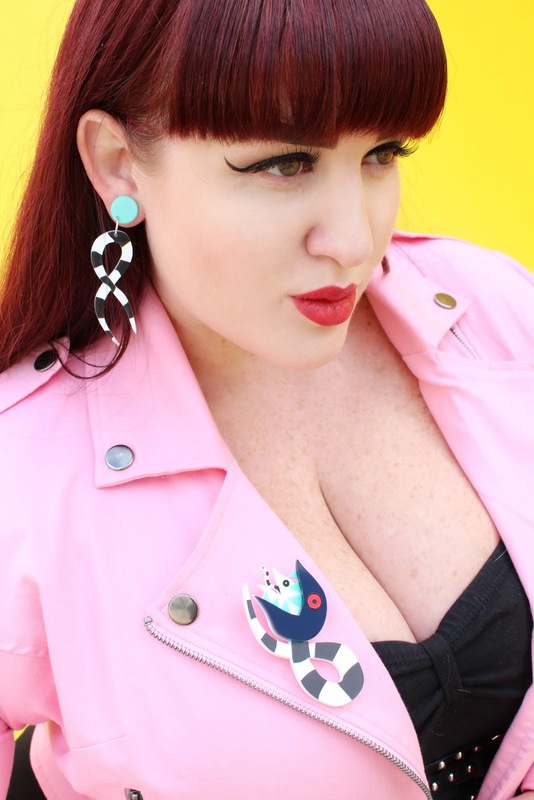 It pairs perfectly on all of my pre pinned moto jackets and works really well as part of a lapel collection. Have you ever wished for a bright, adorable and completely unique Mexican wrestler tiger? Well if you did your wish has been granted. This crazy critter is giant, bold and super freaking cute!! That cheesy smile, the crazy eyes and amazing colour pairing makes this a piece that you will absolutely adore. Wear Tiger Libre on your moto or even as a solo piece on your blouse, shirt or cropped high necked Vixen tops as I do. Pair with plain black black or experiment with more colour options as he will suit so many different prints and colours! Look at that mug! How can you not fall head over heels with this little lad? Lastly another creepy variant of the sand worm but this one is very psychedelic and crazy in the best way possible. A glittering huge red eyeball, beetlejuice tenticals and my new favourite colour pairing of teal and pink. This set of stripped goodies needs their own jacket and I think I've started a new themed moto so let the hunt for more pins and a back patch begin! Kaiju Candy has blown my socks off once again and I can't wait go snap up each and every release. Be sure to keep your eyes peeled as I'll be shooting her pre-order 'IT' range next week and hopefully having a full blog post up soon. Thank you to my amazing husband for capturing these amazing pieces in the perfect way and for making me look purdy.